Well, the day is finally here. J and I headed to the hospital to welcome our daughter. Things didn’t turn out exactly as we planned and we ended up being in the hospital much longer before the birth than we had anticipated. We checked into Labor & Delivery around 6 AM on Friday morning. By 6 PM Friday night, there was very little progress. Neither one of us had eaten since an early morning stop at the McDonalds drive thru and the combos I brought with me just weren’t cutting it. I didn’t really want to leave J by herself, but I needed something to eat. She had just ordered something from the cafeteria, but I hadn’t purchased any meal tickets for myself. Since I would have had to go down to the downstairs to go to the cafeteria, I decided to see what the coffee shop in the atrium had to offer. 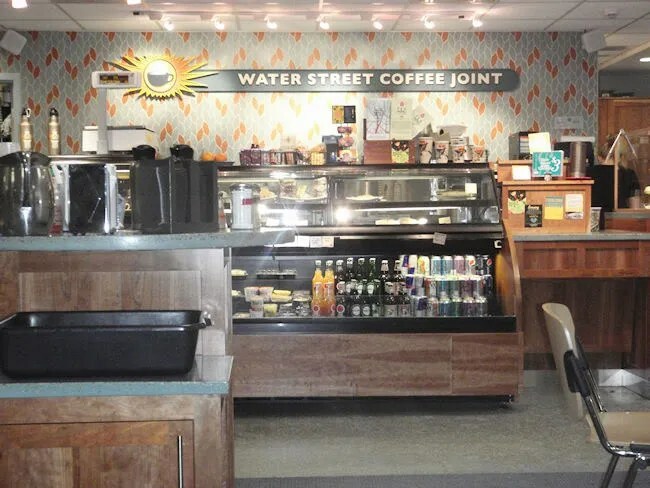 If you’ve been in Kalamazoo for any period of time, you already know Water Street Coffee Joint. They have three locations in town. The downtown restaurant is right across the street from Bell’s on Water Street. The second location is on Oakland in the Oakwood Neighborhood. Not being a coffee drinker, I’ve never really had any reason to go to either location. We did meet our Doula at the Oakwood location for our initial meeting, but J and I had eaten dinner at Fletcher’s beforehand, so we didn’t even really look at the food options. The third location opened up in late 2010 in the Atrium area of Borgess Medical Center on Gull Road. It’s located right past the reception area near the waiting room on the main floor. They have a rather large display case full of baked goods, desserts, and gourmet sandwiches as well as their full line of locally roasted coffee. I really had no idea what kind of food options they would have when I made my way downstairs late in the evening on Friday. I was really hoping for something savory so I didn’t have to venture out in the snow. Luckily for me, there were a few people in front of me when I got there so it gave me time to check things out. They have some pre-packaged sandwiches in an open display up front which also has a display of tea and Boylan Soda. I had already hit up the vending machine to get a couple Pepsi’s, so I was good there. I started looking in the closed display cases to see if there was anything in there that sounded good. Of course, there were no burgers or pizza, but hey, I’m more than just a couple delicious foodstuffs. When both of the ladies were done with the customers in front of me, I stepped up to the counter and asked for the Classic Cheese Panini and a slice of the Chocolate Vanilla Cheesecake. The cheesecake was boxed up first and handed to me as I got my credit card out to pay the $10 charge. The sandwich was wrapped in plastic wrap waiting to be heated up, so one of the ladies unwrapped it and threw it on to the griddle for me. They said it would be a few minutes and they’d call out when ready. Before I stepped away to take a seat in the waiting area, they asked if I wanted it wrapped to go or if I’d be eating in the atrium. Had I chose to stay, they serve on real plates, but since I needed to get back upstairs to J, I asked them to wrap it. When I made it back to our room, I really didn’t even know what kind of sandwich I had. 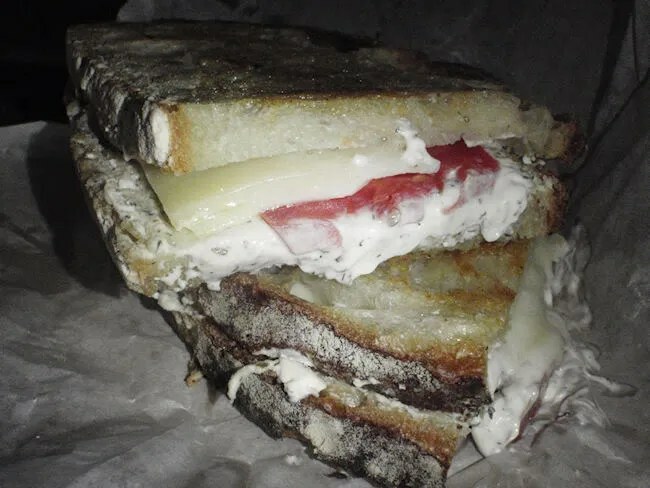 The description said classic cheese, but that was it. What exactly is classic cheese? It’s goat cheese with garlic and herbs and a slice of another hard, white cheese (may have been white cheddar….couldn’t tell.) It’s served on a deliciously crusty bread with two slices of tomato to finish it off. As soon as I unwrapped, I had J’s attention. She loves goat cheese and could smell it from across the room. She walked over to where I was eating and gave me a little puppy dog look asking if she could have a bite. Of course I let her. The goat cheese was very strong and there was a lot of it. It was oozing out the side of the bread which made for tasty but messy meal. 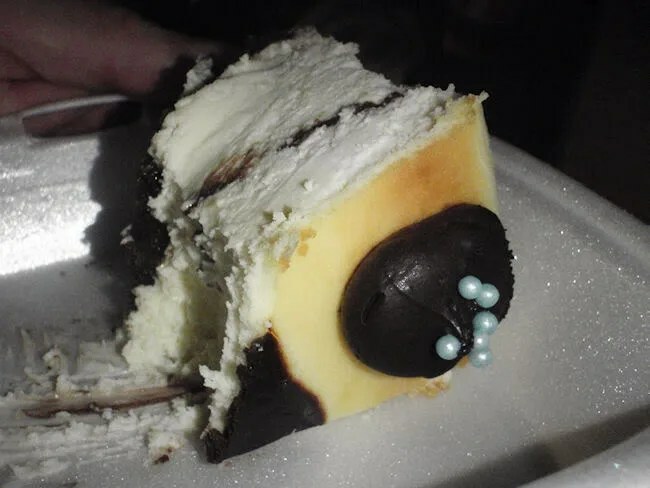 The cheesecake was divine. I didn’t go to Water Street with the intention of getting sweets, but I could swear that piece of cake was calling my name from behind the glass display case. There was a chocolate cookie layer followed by a vanilla cheesecake with a chocolate topping. This too was shared with J as I know she likes cheesecake as much as I do. Checking out Water Street before heading to the cafeteria was a good choice….now, I’m not knocking Borgess’ cafeteria. 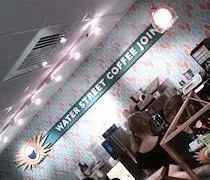 I’ve never eaten there and I’m sure it’s really good, but Water Street is such an incredible option to have when doing business at the hospital. I’m sure before our stay is over I’ll be making several trips back for sandwiches and pastries.